Following the ideology of transition states in both covalent and non-covalent catalysis (see Section 10.2.3), it can be assumed that EF2:GTP as a catalyst has an affinity specifically to the transition intermediate of the translocation reaction. Then, analogously with the EF1-catalysed binding of aminoacyl-tRNA, the translocation reaction proceeds in two phases: the first is the binding of EF2:GTP with the ribosome that induces the pre-translocation state ribosome to acquire an intermediate state with bound EF2, and the second is the conversion of the intermediate into the post-translocation state ribosome as a result of GTP cleavage; the following EF2 release from the ribosome completes the translocation step of the elongation cycle. Speculating about the molecular aspect of the transition intermediate, the similarity between domain IV of EF-G and anticodon stem of tRNA of the ternary EF-Tu:Aa-tRNA: GTP complex ("molecular mimicry") should be taken into account (Fig. 12.3). This similarity suggests that domain IV fits the A site on the 30S subunit when EF-G is bound to the ribosome. In such a case, the interaction of EF-G:GTP (more precisely, its central EF-Tu-like body, i.e. 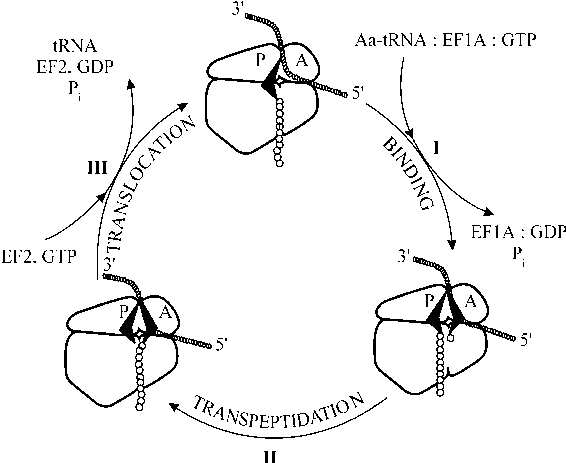 domains I, II and V) with the factor-binding site on the large subunit of the pre-translocation ribosome would result in displacing the tRNA residue of peptidyl-tRNA from the A site and putting domain IV there. There are experimental indications that domain IV of the ribosome-bound EF-G does interact with the decoding center on the 30S subunit (see Section 9.4). Now the peptidyl-tRNA occupies an intermediate position, not being completely settled into the P site yet. The EF-G-induced conformational change of the ribosomal pre-translocation complex seems to involve changes in the ribosome itself, possibly in the mutual positions of the two ribosomal subunits, as well as in the position of the L7/L12 stalk.